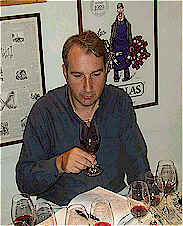 The drums were beating loudly for the 1998 red wines of the Southern Rhne Valley and reasonably loudly for the 1999s. Having so easily sold the 1998s, one American importer arranged for his producers to bring barrel samples of their 1999s to show, as he hoped to write orders. We found tasting the backwards and youthful 1999s to be quite difficult, not being able to predict how they would develop. 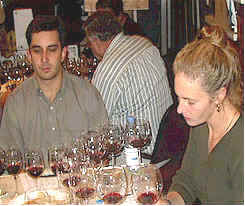 The 1999 vintage is well-regarded by producers. A number of them, we are told, feel their 1999s are as good as or superior to their 1998s. 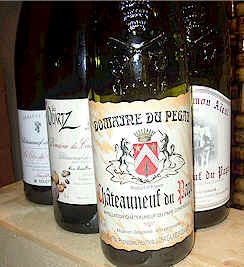 Acidity levels are said to be lower in the 1999s, producing wines which should be approachable at an earlier stage than the 1998s. Many importers have 1999s remaining to sell, so we assembled a reasonably representative set of wines. One wine finished slightly ahead of the pack, despite having but one first place vote and a couple of seconds. The wines were rather closely bunched, statistically and the preferences were all over the map. One critic described Sabon's wine as "Pleasant with modest plum notes, a hint of milk chocolate, faintly toasted oak...it's decent but hardly great." Someone else thought the wine might have been slightly fizzy, noting a few bubbles adhering to the glass when first poured. She found "grapy" and "sweet" notes all through the wine, with a hint of "butterscotch and baked fruit." Another taster found this "pleasant and a bit candied and simple," while someone else summed it up saying "It's a nice Ctes du Rhne, but not a Chteauneuf-du-Pape." I'm in agreement with most of the assessments, finding this to display a simple raspberry fruit aroma with a fair bit of tannins and modest length. One half star rating on my three star scale (no stars being average or ordinary, well-made wine). Though frequently viewed as one of the benchmarks for the appellation, the 1999 Beaucastel didn't fare well in this tasting. One taster remarked "It has a really leather nose." Another found "yeast notes to the aromas and tannic cherry fruit." Someone found "Sweet and sour notes along with a pruney character." 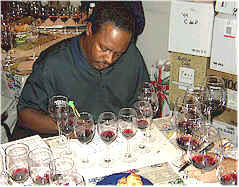 One participant found "green, bitter tannins," while someone else detected "Minerally fruit and wild mushrooms with saddle leather notes and a tea-like character." Another taster agreed with the "tea" assessment, finding "smoky notes and ginseng tea." One person found this "very old-fashioned and I didn't care for the nose as much as the flavors." I wasn't fond of the "cooked" character here, finding stewed plum fruit and a hint of cocoa. It redeems itself on the palate a bit having enough structure to take the edge off its "sweet" character. I didn't find it to be especially exciting at this stage. This wine had a few fans and a number of detractors. One panel member found it to be "gamey, with a barnyard-like note, chewy, rustic tannins and dried oak/tree bark notes." Some else described it as "tarry and showing wet dog aromas." One person found "Mocha, peppermint and raspberry with hints of coffee, chocolate, mint and eucalyptus." Others found "weedy" notes, with one person encountering "Barnyard, sour and vegetal notes..." One taster objected to its "grippy tannins," while another person found it "not cellar-worthy with green, stemmy tannins." I found those gamey notes attractive as the wine reminded me of wild herbs and lavender fragrances with some underlying spice and brushy aromas. I found the wine moderately tannic with typical, peppery/spicy characters on the palate. I thought this was quite a good wine. Two stars. "Cloudy in appearance, this showed metallic, herbal, grassy notes with dill...it's a bit flat, but nice for a quaffing wine." said one critic. Another person found "tart, wild berries...boysenberries...smoked minerals and bitter chocolate." One taster encountered "fennel and rhubarb with some under-ripe cherry notes." Another person found a "long finish...not especially complex, but it's good." I detected a warm, jammy fragrance here with some cooked berry fruit and a slightly 'stony' character on the nose. It's got some spice on the palate with berryish fruit and a bit of astringency. One half star rating. Described by one person as "Ripe, jammy and flat-tasting with stewed fruit," this wine was pegged as "Seriously astringent" by another critic. 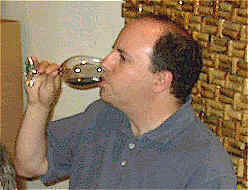 One panel member found it to have "Chewy tannins with bitter plum fruit and dry wood tannins with a bitter finish." Another found it "Chalky and showing bitter plum fruit and bing cherries." Someone else found a "resinous and piney character," while another taster detected "an intense nose with caramel, taffy and black cherry fruit and a long finish." I liked the black cherry fruit here as it was ripe but not the over-ripe, jammy sort of character I found in many of the wines. The dark berry and cherry fruit comes through with a veneer of astringency but it seems balanced for long-term cellaring. One-and-a-half stars. "This wine screams Chteauneuf-du-Pape, being a classic example of the terroir and old vines' wine." said one participant. Another found "Black licorice, baked blackberry...grapey...cherry flavors. This has so many diverse flavors." One person found "Moderate, black fruit notes...red clay...loganberry and rose petal notes." Another taster detected a "banana" note. I found some earthy notes and warmed earth fragrances with a mild chocolate notes. It's a very pleasant wine with mild spice flavors and a bit of berry fruit. I thought it was more a Ctes-du-Rhne than a 'grander' vin. Perhaps a half star to one star rating. "Super velvety tannins with ripe, black cherry fruit, some minerally notes and leather, semi-sweet chocolate." were the words of one fan. Another found "Ghiradelli chocolate notes with glue and dish-water tones and a sour finish." Someone else said "It's the best of the bunch with a dusty note on the nose and a lot of substance though it's kind of coiled up presently." One person found this to have an "exotic nature with star anise, lime peel and exotic fruit flavors." I liked the wine quite a bit, but downgraded it for having the obvious oak so up front and almost covering the Chteauneuf character. There's a spicy and cedary quality to the nose, with lots of wood on the palate. Certainly one of those "Internationally-Styled" wines! One star. "Deep and rich, this shows toasted spices, some vanillin and mocha notes with spice and blackberries on the palate." said one taster. Someone else found it far less attractive, saying it's "stinky, weedy and shows silage and wet hay fragrances with low acidity and it's bitter and under-ripe." One person found "Chocolate and apricot notes with some coffee...very chewy on the palate." Someone else found "bitter tannins," while another found it to be "grassy and resinous." I found warm berry notes with some cooked plum fruit and mild spice notes. The same elements show up on the palate with mild tannins and a peppery finish. One-and-a-half stars.